Louise Carver releases ‘This Thing Called Love’ as the third single off her beautifully crafted album ‘Hanging In The Void’. The song also kicks off Woman’s month and in celebration Louise Carver is hosting a special Woman’s Day Concert on the 9th of August at The Courtyard in Parkhurst. Limited Tickets Available. ‘This Thing Called Love’ captures the magic of when two people start falling in love. Carver sings about the early stages of romance and the excitement of getting to know someone. The production by Mark Beling is sweetly driving, with a wonderful uplifting groove giving the song it’s wonderful uptempo feel. 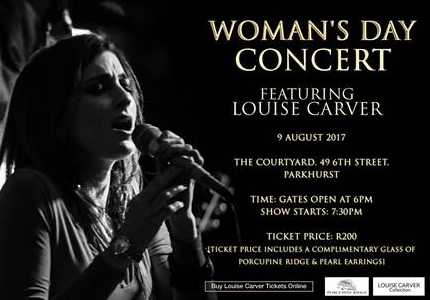 Catch Louise Carver live on Woman’s Day, 9 August, at The Courtyard in Parkhurst.